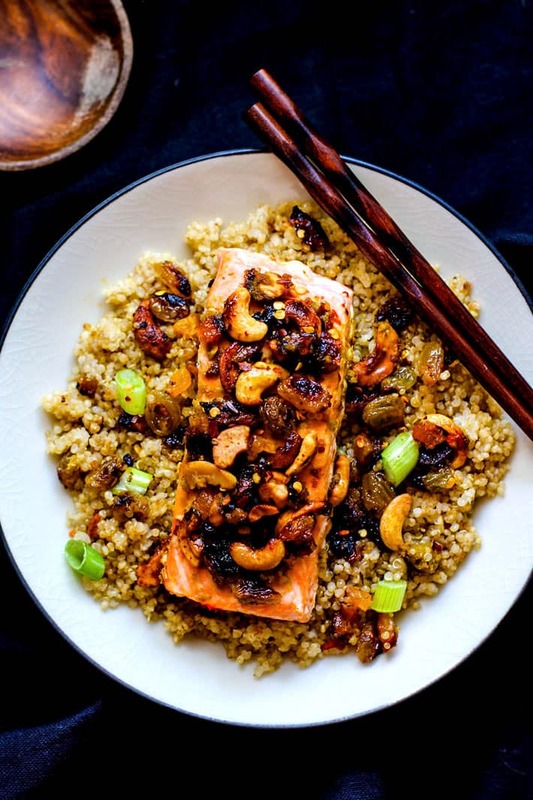 Green Curry Salmon and Cashew with Quinoa! Sweet and spicy green curry combined with cashews, salmon, and dried fruit! 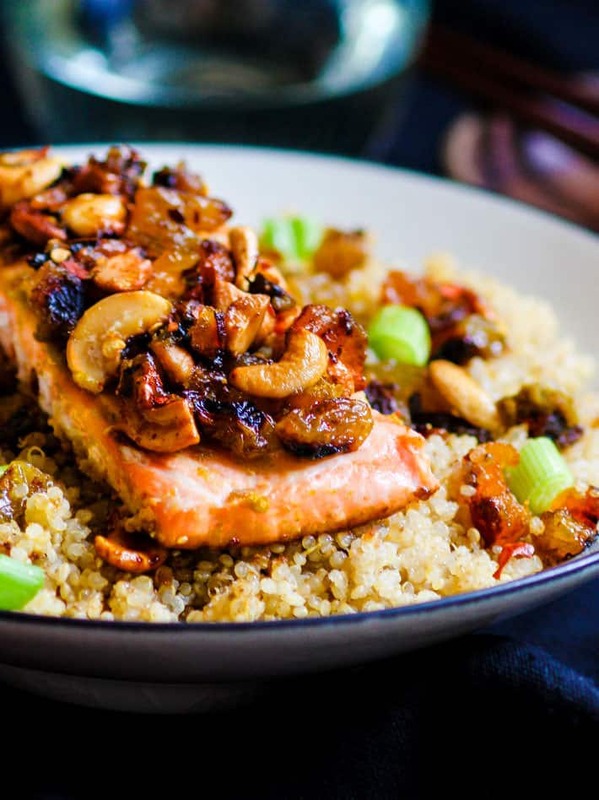 A healthy flavorful meal that is packed with anti-oxidants and comes together in 30 minutes! Great by itself or served on top of garlic quinoa. Hello friends! Hello Wednesday! 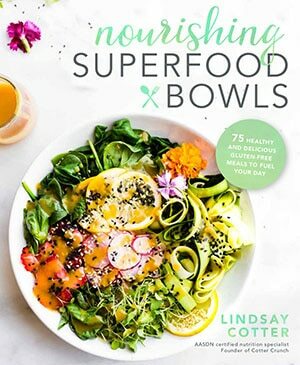 Hello more nourishing anti-inflammatory recipes! I told you I was going to dedicate this week to all things curry and turmeric, right? Oh, well, now you know. Because OH MY we need it. And as you can tell, I tend to focus on certain food themes on a weekly basis. Haha. Next week will be all about comfort foods. Kidding ! Maybe. Okay, back to this recipe though. Curry, Salmon, Cashew, and did I mention there’s dried apricots and currants? Yep! But here’s the kicker, it’s not red curry that makes this Salmon dish so flavorful, it’s GREEN curry! Green curry is a variety of curry derived from Thai and is made with green chilies. It has a sweeter and more pungent flavor than that of red curry (made with red chilies). A lot of green curry dishes will include herbs such as sweet basil, kefir lime, lemon grass, green onion or shallots, and of course TURMERIC. Which is what gives this dish it’s caramelized color. Well that and the honey I added. So good! So what is it about all these spices in green curry that make it healthy? Lots! Green Curry spices and herbs –> Turmeric, coriander, galangal, and basil all have powerful antioxidants. And all help fight inflammation and protect the body free from free radicals. Bonus : if you use Thai Holy Basil, it “supposedly” has a calming effect. Ohh.. I need that like yesterday. Although, can I let you in on a secret? I was skeptical about this recipe at first. It all sounded so good in my head. But could I pull of the green curry and apricot and salmon together? There was only one way to find out. First pick a out a beautiful piece of sizzlefish sockeye salmon! Make, test, taste, and repeat. Which is what happened. And all I can say is PRAISE GOD for green curry paste! It’s fabulous! If you choose to make the quinoa, simple combine your stock and oil/garlic in rice cooker or in pot and cook according to instructions. Usually around 15 minutes. For the salmon. 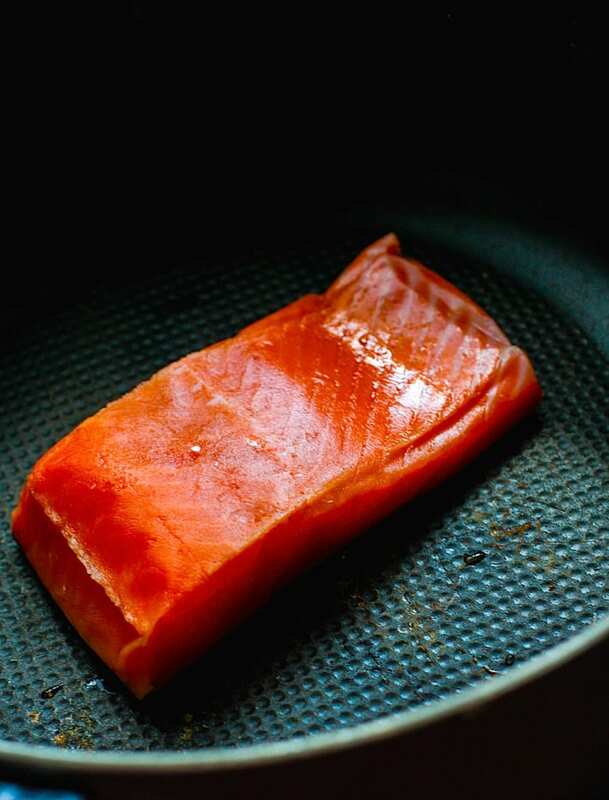 First clean your salmon and lay on parchment paper. In a small bowl, whisk together your curry paste, sesame or olive oil, honey, cream, fish sauce, and chili flakes. Spread evenly over fish. Keep a little extra for the pan. Place fish and any remaining curry paste/sauce in pan on medium heat. Add in your dried fruit and cashews and maybe a tad more oil if needed. Cook on medium heat for 10-12 minutes. The dried fruit and cashews will start to brown. Make sure they also get mixed in with a little of the leftover honey curry mixture in the pan. The salmon flesh is ready when its flaky and no longer red but a nice even pink. Serve on top of steamed garlic quinoa. Add any remaining mixture or fruit/nut to the plate and garnish with chili pepper and green onion. Add a little extra oil to the pan (maybe a tsp) and then add in your dried fruit and cashews. We use sizzlefish sockeye salmon for this dish. Feel free to use another form of dried fruit as well. this dish is great by itself. You don’t need quinoa but it does compliment it well! The quinoa serves about 4. Alright, let me know if you try this cashew curry recipe. It’s easy. I promise. And you will want to make it again. If not, I’ll make it for you and we can have curry in a hurry Dinner date. Curry lovers, what’s your favorite green curry dish? Do you add anything special? Green Curry Salmon and Cashews! A quick #healthy #glutenfree meal full of powerful nutrients! Red curry fan or green? Hard questions on a Wednesday! If you have a hard workout, run, or training session this week; I highly recommend this as a recovery meal. It will do wonders for your soothing muscles and inflammation! 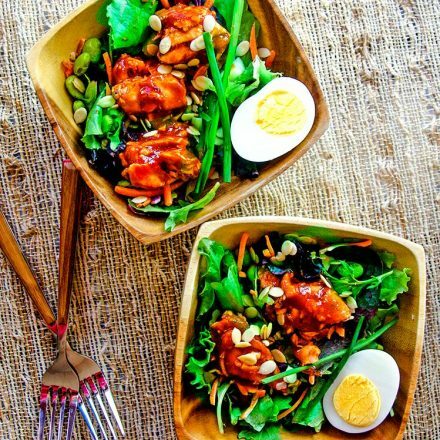 Tangy Asian BBQ Salmon Salad – Plus Lycopene Absorption! So many of my favorite foods all in one dish. Pinning for menu planning. I’m blown away by how good this looks! I need to get on board with curry, I’m already very into salmon 🙂 Your photography is just incredible, too! Sounds like I should have this Saturday (after the 20 miler). I honestly don’t know if I prefer red or green curry. I haven’t been able to have much curry because although it is made with coconut milk, it has such a high fat content that it can be hard on me. But I do love the Bangkok Green Curry at Noodles and co so I guess I like Green? This looks incredible. I really love both green and red curry however two weeks ago I had green curry with kabocha squash, a mix of random veggies and tofu and omgah it was so good. I’ve never had green curry. I’m sure this tastes amazing so I will have to give it a whirl next Sizzlefish order! Which curry is less spicy? That’s the one I like- I’m somewhat spicy intolerant! Love the combos you come up with for fish dishes- mine are usually so standard and boring… this would definitely spice things up! i think you’d like green curry. Sweeter! This sounds amazing. I love green curry, salmon and quinoa. What a great combo! I wouldn’t have thought to put them together! Yum! Love me some curry! Green, thank you. This sounds like a great one to try–I’d feel like a real chef serving this to guests! I absolutly love cooking with turmeric! It’s such an amazing plant and it’s great you’re getting the word out about its anti-inflammatory and antioxidant properties…what an amazing superfood! This meal looks amazing! 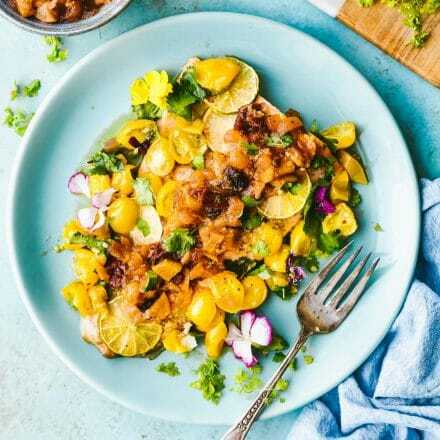 I’m obsessed with all things seafood and am loving this green curry and cashew idea you’ve got going on. Brilliant, my dear! THIS looks good…saving this recipe for sometime this week! I *think* we have some salmon in the freezer! 😀 Thanks for putting out such quality, healthy recipes and sharing them with us! One of those dishes that makes you want to cry (with joy). O salmon heaven!!! Curry is the BEST!!! Been eating homemade ginger curry for years because I love to cook Vietnamese food. I also mix it at times with a nut butter. This recipe looks delicious and your plating is exquisite!!! Love tumeric and curry! So flavourful and so good for you. Can’t wait to try it! Can I please have all of this! 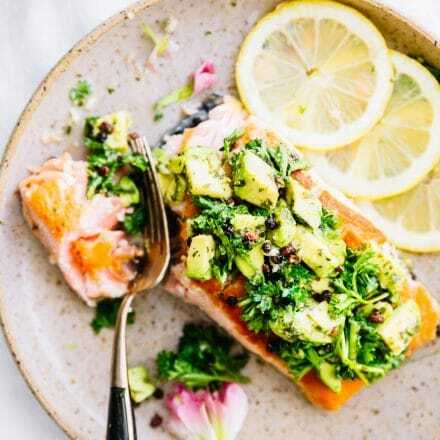 I love your salmon recipes, you have such a gift on making fish look gorgeous. I just want to eat it all! These flavors though – so perfect!! I might even be able to get Dave to try this, if not, more for me! This looks soooo good! I love red curry – I make a red chicken curry (<3 turmeric) with cashews, so I'm certainly all over this recipe. I've never tried green curry but I need to now! I’ll just tell you straight up – lady – my tasetbuds cannot handle all this deliciousness so am coming over for dinner tonight! I LOVE the green curry and dried currants and cashews and coconut creme – gosh such a flavorful dish! That just means more for you! ? So I read this post early this morning before breakfast.. and I was drooling. You know you created a winner when that happens! This sounds delicious! Looks as one too! Yum yum! I love both red and green curry and normally just mix the paste with coconut milk and a little honey and pair it with chicken and veggies. I think I prefer red curry but my favourite always chops and changes! Haha! Oh yes!!! I am so excited to try this. oh I’d be honored if you did! and any feed back from the chef herself! You are too sweet. When I am back in a regular kitchen again, i will give it a go for sure. Pinned and drooooling! That looks so delish!! Wow, Lindsay! This looks SO good, I just want to dig right in. I almost never use cashews even though I always have them on hand. They’re so expensive that I just like to hoard them away… definitely breaking into them to make this! i thought you were home? Love the sweet and spicy combo! 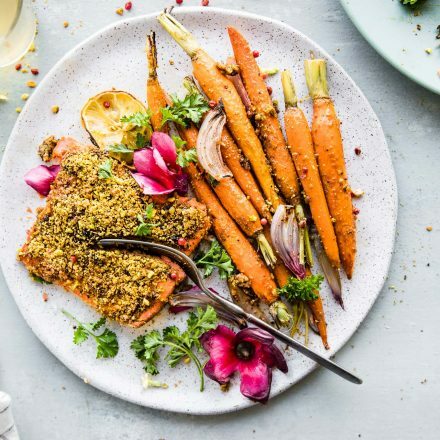 I always make salmon the same boring way (lemon and rosemary), but this combo looks amazing! Your photos/recipes always look amazing.. but this looks EXCEPTIONALLY stunning. I don’t even like salmon and I want to dive into this. I would love to have you live next door to me Lindsay and teach me how to cook all this delicious food. <3 Do you create a recipe every day? This salmon is absolutely stunning, Lindsay! Love turmeric! Michelle took a break last year of all spices but now that her skin is better she is trying spices again 🙂 We will have to give this a try sounds great. 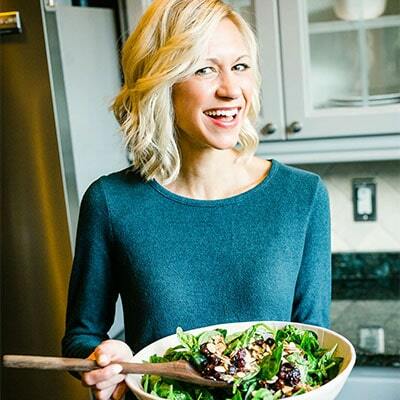 This certainly is one heck of a healthy meal, Lindsay .. not to mention tasty! You’ve pretty much combined some of my favourite flavours here. 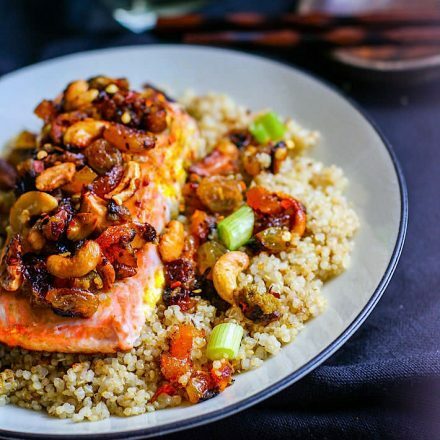 I love anything with cashews in, and salmon is a firm week-night favourite. So impressive that this can be on the table in 30 minutes, too! Oh my goodness… YUM!! I am seriously dying to try this one. 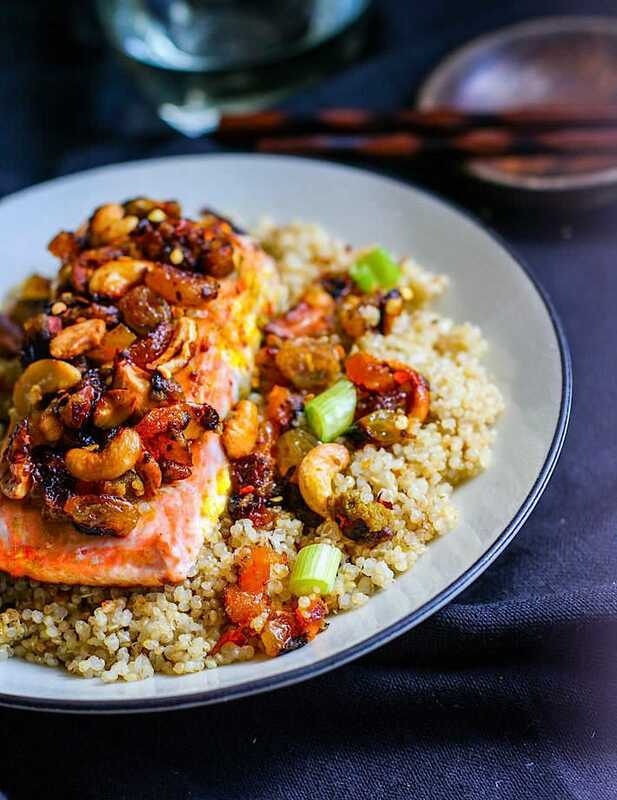 I’m always looking for new ways to make salmon and this looks delicious!